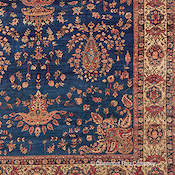 View a wide selection of antique Mahajiran Sarouk rugs now available for sale. Located in West Central Persia, Sarouk was a weaving region renowned in the 19th century for its high quality, artistically distinctive carpets. The Mahajiran Sarouk (also spelled “Mohajeran Sarouk” or “Mehajeran Saruk”) style dates from the turn of the 20th century and is acknowledged as the very finest quality of vintage Sarouk rugs. 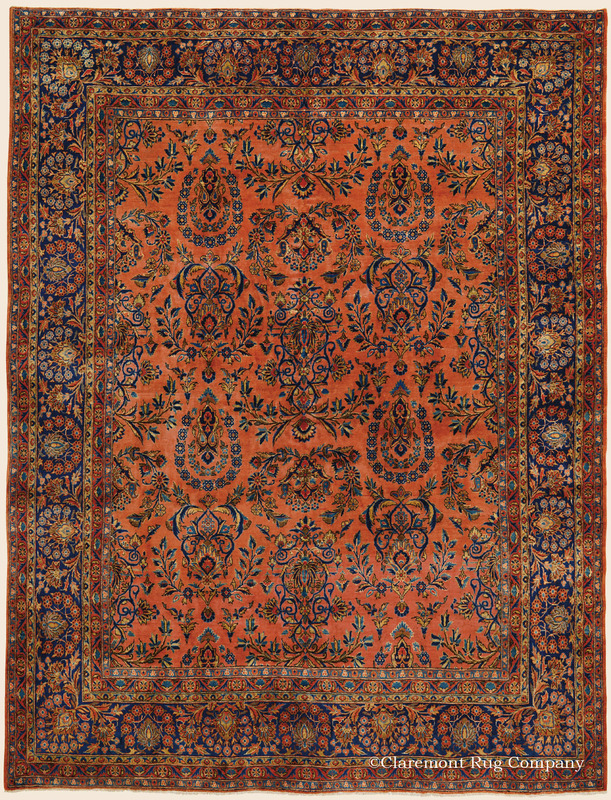 A mark of great respect, the name “Mahajiran” is properly attached only to a precious few Sarouk carpets that have the finest lamb’s wool, glowing natural dyes, consummate workmanship, and inspired artistry. Mahajiran Persian carpets are also the most finely woven of vintage Sarouk rugs, with a deep rich pile which allows the full beauty of their highly luminous wool and color range to show. 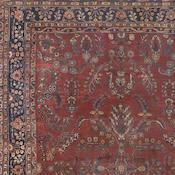 The wool quality of Mahajiran Sarouks is renowned. With a highly silken quality, its luster illuminates the Sarouk’s natural dyes, adding tremendous depth.  This lanolin-rich wool, along with their heavy construction, account for the tremendous durability of fine Sarouk rugs, which typically offer several generations of heavy use. The allover vase and floral spray designs characterizing Mahajiran Sarouk carpets were taken from the field decoration of their predecessor, the 19th-century medallion-and-corner piece antique Ferahan Sarouk carpets. 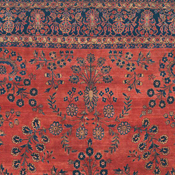 This motif, modified by Sarouk weavers who were also exposed to European and East Indian textiles, developed into one of the most distinguished and sought-after Persian carpet patterns. 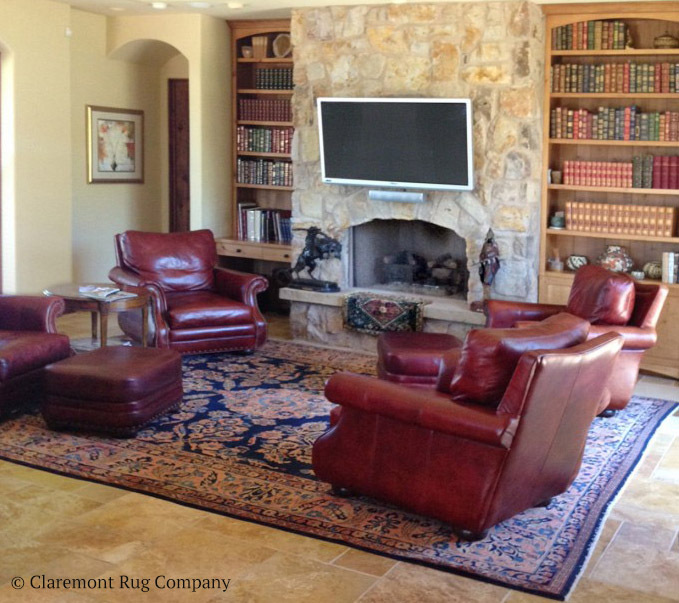 The best Mahajiran Persian carpets are also prized for their clarity of design. They characteristically use allover patterns with a subtle central axis, and consist of a series of finely drawn blossoms, leaf, vinery and sometimes vase forms. Other Mahajirans are unusually spacious in design, with every delicate floral grouping seeming to float on a variegated, soft-toned field. Our extensive collection of rugs in the elegant Mahajiran Sarouk style, woven circa 1900 to 1925, includes a wide array of small area-size rugs to grand palace-size carpets. 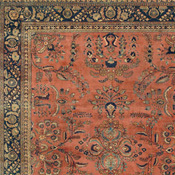 The field color of Mahajiran Oriental carpets is traditionally a burnt sienna or terra cotta and, less frequently, soft salmon or pale rose. 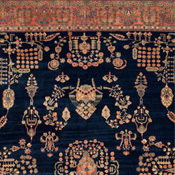 Most rare by far are the superb carpets with a deep indigo blue base. 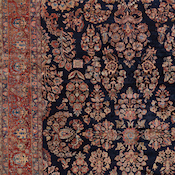 Seventy-five to one-hundred-year-old “Blue Mahajirans” are highly prized for the great visual depth of their midnight indigo blue base, accentuated by the tremendous sheen of their lamb’s wool surface. Golds, indigo blues in shades from sky to midnight, and in some cases rich green tones are used as accent colors. 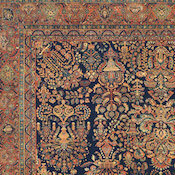 Some Mahajiran Sarouk Persian carpets usually display strong “abrash” or intentional color shading, used as an artistic technique to add a sense of depth and movement to areas of open space and to highlight the secondary motifs. 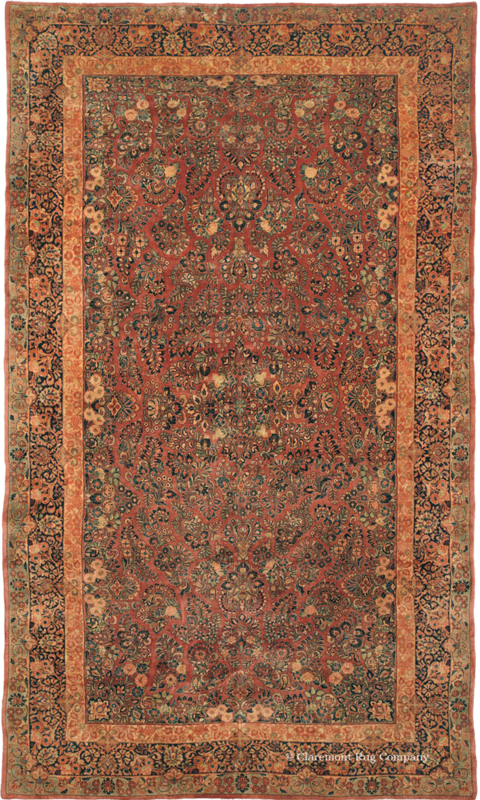 To this day, Mahajiran Oriental carpets are highly sought after in Europe, especially in Germany and England, where their rich wool, fine craftsmanship, and plush pile are considered the essence of a Persian carpet. 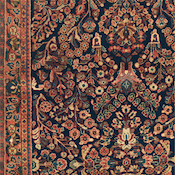 With strong international demand for these magnificent carpets and their very limited availability, Mahajiran Sarouk carpets stand at the center of desirability among early 20th-century decorative carpets. Their gracious ambiance, tremendous durability and great compatibility with contemporary decors have made Mahajiran Sarouk carpets a favorite of our clients for many years.